Don your helmet and goggles for a scenic tour above Philadelphia. Fly over the Battleship New Jersey, the Ben Franklin Bridge and Penn’s Landing. Look down into Old City and see eye-to-eye with Billy Penn. Then you're off to see a bird's-eye view of the art museum, Boathouse Row, the Schuylkill River and beautiful Fairmont Park. Add a little scenic country ride to your city tour. 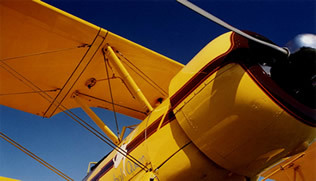 After a spectacular flight over the city (The Spirit of 76) you will have a choice to head west to City Line Avenue and out toward Malvern over the Main Line or head north to New Hope and Doylestown into beautiful Bucks County. 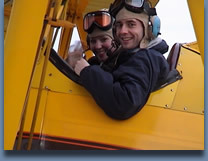 Take pictures or take the controls or just sit back and enjoy the flight as you’ll have time to do it all in this 75 minute ride. Combine The Spirit of 76 and Franklin’s Favorite plus Lake Nockamixon and The Delaware River and you’ll be on The Grand Tour with the Cannibal Queen! 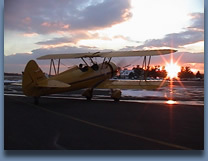 The spectacular sunrise flight is for those who cherish the start of the day or snuggle with your sweetheart and share the beauty of a romantic sunset in this magnificent open-cockpit biplane. 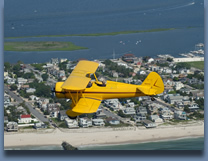 We also give tours over New Jersey Beaches. 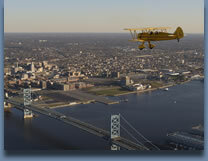 BiPlane Rides over the metro Philadelphia area.